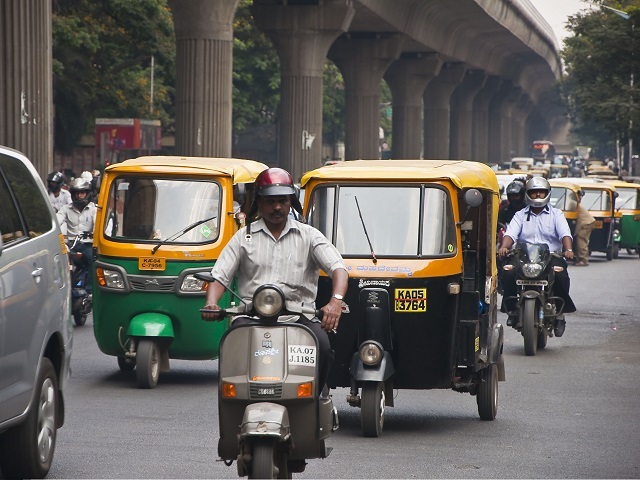 The Indian city of Bangalore is engaging the private sector to shift how employees commute to work, reducing traffic congestion and costs for everyone. Photo by Miroslav Čuljat/Flickr. The number of cars on India’s roads has been doubling every 8-10 years—and it’s costing the country. A WHO study from 2014 found that 13 of the world’s 20 most polluted cities are in India. The country experiences 120,000 deaths per year due to traffic fatalities, more than any other country. And traffic congestion in Bangalore alone costs the city approximately 5 percent of its economic output. City governments in India are still focused on investing in road expansions and overpass construction projects rather than curbing car dependence and improving public transport services. Instead of waiting for local governments to act, a handful of Indian businesses are taking the initiative to implement transport demand management (TDM) strategies, improving the productivity of their employees and reducing the social costs of car congestion. Employer-initiated TDM strategies have been especially common in the information technology (IT) sector, because most IT employees in India use private cars to commute to and from work. These strategies have been relatively easy to implement given the availability of information—such as employees’ origins and destinations, duration, and frequency of trips—for designing optimal transit and carpool routes. Some initiatives have included providing employees with commuter subsidies for public transport or carpooling. Other businesses have experimented with company buses that transport workers from nearby metro stations to offices, providing much-needed “last-mile connectivity.” These programs have successfully shifted 30-50 percent of the targeted employees from cars to public transport, resulting in reduced travel times and significant cost savings for employers. Not only are employees more productive from shorter commutes, bus and other public transit subsidies are much cheaper compared to private company buses. For example, Wipro—a major IT business in Bangalore—worked with the Bangalore Metropolitan Transport Corporation (BMTC) on specific routes designed to move workers more comfortably and efficiently. This collaboration improved employees’ user experience, reduced costs, and shifted commuters from private company buses or cabs to public transit. BMTC introduced high quality bus services that were air-conditioned and convenient for WIPRO’s employees and other transit riders. This initiative encouraged employees to commute by bus rather that private vehicle and is credited with reducing employee GHG footprint by almost 16 percent in the first year of implementation. Designated bus services for employees, in partnership with Haryana State Transport, Delhi Transport Corporation and Volvo. Several other IT businesses have shown interest and are moving forward to implement TDM measures as well. For example, Infosys, a major IT company with 180,000 employees, recently announced to roll out its own TDM program over the next four years to reduce its employees travel emissions. Worldwide, TDM strategies have been shown to reduce traffic congestion as well as the costs of building, maintaining, and operating city roads. In India, cities like Bangalore, Mumbai and Delhi have proposed congestion charging initiatives like London’s, but these plans have hit roadblocks. While several cities have drafted street parking policies, implementation seems unlikely, due to opposition from commercial business owners and car users. City leaders need to recognize the value of TDM strategies—both to the private sector and local communities—and support these measures by improving the quality of public transit without compromising affordability. City governments need to implement appropriate parking policies as a precursor to TDM to ensure success. Furthermore, strong communication campaigns are necessary for educating the public about the harmful impacts of car dependence on health, safety, and quality of life. To address mounting car ownership, city leaders and decision makers need to implement a diversity of TDM strategies. The successes of employer-initiated TDM measures demonstrate the potential for citywide TDM and signal to political leaders that cost-effective solutions exist. It’s time that city leaders in India recognize the benefits of sustainable mobility and incorporate TDM strategies into their own public agendas. The future of their economies and their citizens depends on it.